At the 35th Congress of the International Society for Blood Transfusion (ISBT), members of our network gathered to share their knowledge and exciting new educational resources. Dr. Yulia Lin, from the University of Toronto and Sunnybrook Hospital, presented a prospective evaluation of Transfusion Camp, a novel approach to transfusion medicine education. A five-day program to educate post-graduate residents across medical disciplines about the appropriate use of transfusion, Transfusion Camp is a proven, effective approach to enhancing knowledge. In 2016, the camp partnered with our Centre for Innovation to expand beyond University of Toronto residents and engage six other medical schools from across Canada. Our medical experts from across the country are also involved in delivering the camp curriculum. Learn more about Dr. Lin’s innovative approaches to transfusion medicine teaching and her partnership with Canadian Blood Services here. Dr. Nadine Shehata, a Canadian Blood Services Medical Officer affiliated with the University of Toronto and Mount Sinai Hospital, presented the work of the International Collaboration for Transfusion Medicine Guidelines (ICTMG). Established in 2011, and supported by our Centre for Innovation, the ICTMG follows well-accepted methods to develop systematic reviews and evidence-based clinical guidelines. Dr. Shehata shared their experience in disseminating the ICTMG work through a dedicated website, podcasts and treatment algorithms. Learn more about the ICTMG here. Congratulations to Canadian Blood Services Medical Directors Dr. Gwen Clarke and Dr. Mindy Goldman who were elected to the ISBT Board of Directors during the 2018 Annual General Meeting. Dr. Clarke will serve as the Secretary General and Dr. Goldman will serve as the Regional Director for Northern Americas. As mentioned in our previous post, Canadian Blood Services hosted a booth at IBST 2018 to showcase research and education initiatives facilitated by our Centre for Innovation. We held a special education event at our booth on Monday June 4 for conference delegates and our network members to come together and share ideas. 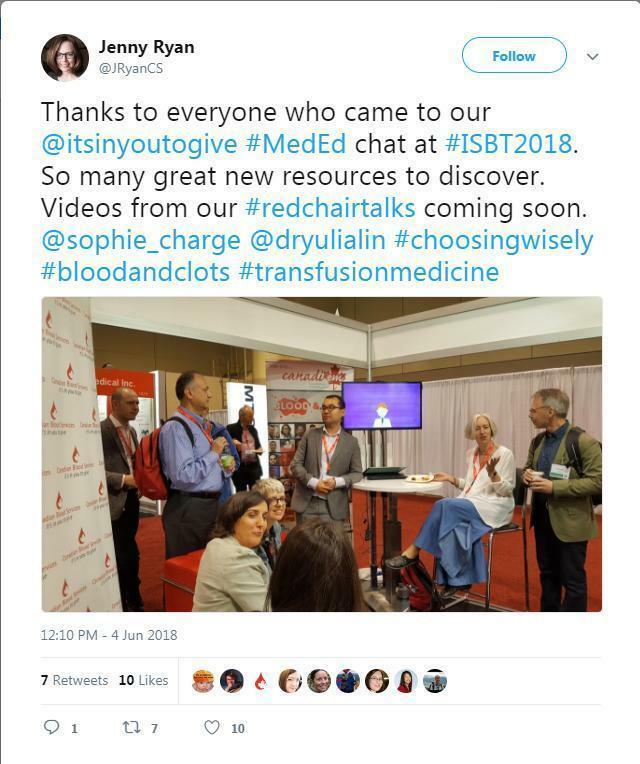 Our partners who, with financial support from our BloodTechNet program, have developed transfusion medicine educational resources were at the booth to share their innovative approaches to education. Dr. Andrew Shih from Vancouver General Hospital promoted the Blood & Clots Series. Housed on CanadiEM, this series of online educational resources focuses on some of the most difficult dilemmas faced in transfusion medicine today: how to manage patients who are bleeding, clotting, or both, and are designed with emergency doctors and front-line/primary care physicians in mind. Awesome socks and t-shirts were given out to visitors who participated in a Blood&Clots skills testing game. An international conference is the perfect place to launch an app, and we did just that! The Primary Immunodeficiency Disease (PIDD) app was developed by Dr Doug Morrison, Pamela Danesin and Susanna Darnel from the BC Provincial Blood Coordinating Office (BCPBCO) in collaboration with a group of immunologists and transfusion medicine physicians. The PIDD app can be downloaded for Apple or Android and is a wonderful tool to support the diagnosis, treatment and monitoring of patients with PIDD. Dr Clinton Campbell from QEII Health Sciences Centre was also there to showcase the short videos that his team developed to disseminate Choosing Wisely Canada transfusion recommendations, and Clare O’Reilly from the BC Children’s Hospital shared the Transfusion Bits & Bytes developed with the BCPBCO. Learn more about how to apply for our BloodTechNet program funding here and the educational resources developed through the program here. Our Canadian Blood Services scientist, Dr Ed Pryzdial, who is also Centre for Blood Research associate director, was also present to discuss the many training and education opportunities that are offered through this UBC-based centre, and the unique partnership our Centre for Innovation has with the entire for Centre for Blood Research. ISBT 2018 was an opportunity to learn, and to connect. A sincere thanks to all Canadian Blood Services’ folk for their participation in the scientific program and all the exciting events at our booth. We hope that you came away inspired to keep innovating and pushing the boundaries in transfusion medicine, science and education!